Here's what the Encyclopedia Galactica has to say about alcohol. It says that alcohol is a colorless volatile liquid formed by the fermentation of sugars and also notes its intoxicating effect on certain carbon-based life forms. The Hitchhiker's Guide to the Galaxy also mentions alcohol. It says that the best drink in existence is the Pan Galactic Gargle Blaster. It says that the effect of drinking a Pan Galactic Gargle Blaster is like having your brains smashed out by a slice of lemon wrapped round a large gold brick. The Guide also tells you on which planets the best Pan Galactic Gargle Blasters are mixed, how much you can expect to pay for one and what voluntary organizations exist to help you rehabilitate afterward. Take the juice from one bottle of the Ol' Janx Spirit, it says. Pour into it one measure of water from the seas of Santraginus V-- Oh, that Santraginean seawater, it says. Oh, those Santraginean fish! Allow four liters of Fallian marsh gas to bubble through it, in memory of all those happy hikers who have died of pleasure in the Marshes of Fallia. Over the back of a silver spoon float a measure of Qualactin Hyper-mint extract, redolent of all the heady odors of the dark Qualactin Zones, subtle, sweet and mystic. Sprinkle Zamphuor. Add an olive. 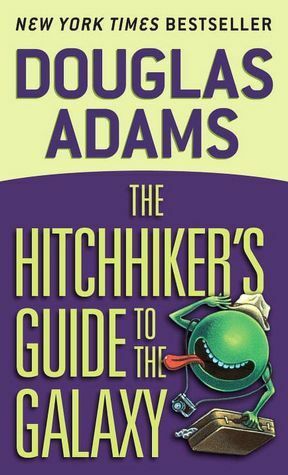 The Hitchhiker's Guide to the Galaxy sells rather better than the Encyclopedia Galactica. "Six pints of bitter," said Ford Prefect to the barman of the Horse and Groom. "And quickly please, the world's about to end." The barman of the Horse and Groom didn't deserve this sort of treatment; he was a dignified old man. He pushed his glasses up his nose and blinked at Ford Prefect. Ford ignored him and stared out the window, so the barman looked instead at Arthur, who shrugged helplessly and said nothing. So the barman said, "Oh yes, sir? Nice weather for it," and started pulling pints. "What's that, foregone conclusion then, you reckon, sir?" said the barman. "Arsenal without a chance?" Ford looked back at him, genuinely surprised. "No, not really," he said. He frowned. The barman breathed in heavily. "There you are, sir, six pints," he said. Arthur smiled at him wanly and shrugged again. He turned and smiled wanly at the rest of the pub just in case any of them had heard what was going on. None of them had, and none of them could understand what he was smiling at them for. A man sitting next to Ford at the bar looked at the two men, looked at the six pints, did a swift burst of mental arithmetic, arrived at an answer he liked and grinned a stupid hopeful grin at them. "Get off," said Ford, "they're ours," giving him a look that would have made an Algolian Suntiger get on with what it was doing. Ford slapped a five-pound note on the bar. He said, "Keep the change." "What, from a fiver? Thank you, sir." "You've got ten minutes left to spend it." The barman decided simply to walk away for a bit. "Ford," said Arthur, "would you please tell me what the hell is going on?" "Drink up," said Ford, "you've got three pints to get through." "Three pints?" said Arthur. "At lunchtime?" The man next to Ford grinned and nodded happily. Ford ignored him. He said, "Time is an illusion. Lunchtime doubly so." "Why three pints all of a sudden?" "Muscle relaxant, you'll need it." "Did I do anything wrong today," he said, "or has the world always been like this and I've been too wrapped up in myself to notice?" "All right," said Ford, "I'll try to explain. How long have we known each other?" "How long?" Arthur thought. "Er, about five years, maybe six," he said. "Most of it seemed to make some kind of sense at the time." "All right," said Ford. "How would you react if I said that I'm not from Guildford after all, but from a small planet somewhere in the vicinity of Betelgeuse?" "I don't know," he said, taking a pull of beer. "Why, do you think it's the sort of thing you're likely to say?" Ford gave up. It really wasn't worth bothering at the moment, what with the world being about to end. He just said, "Drink up." He added, perfectly factually, "The world's about to end." Arthur gave the rest of the pub another wan smile. The rest of the pub frowned at him. A man waved at him to stop smiling at them and mind his own business.